Happy Valentine Day! I am pretty sure that everyone has some books about love to share this week. I already shared some of mine on Thursday, and here are the rest of our favorites from this week. Blast Off to Earth was recommended by Almost Unschoolers. Smarty really enjoyed both the format of this book with its speech bubbles and its content, which is essentially a review of Earth continents. She asked for it every day, and by the end of the week was reading it by herself. She was paying close attention to map legends identifying grass, trees, deserts and mountains on each continent and asked a lot of questions on minute details in the illustrations. I am very pleased with this book and consider buying it for our home library. This book might be controversial to some parents and was banned by some schools. Well, in our house we strongly believe in equality and tolerance, and we want Smarty to learn pretty early that families can be different, but love and desire to care for children is universal. Her best friend is adopted by a gay couple who are wonderful parents and terrific human beings, so she learns this lesson not just from books but from real life as well. OK, back to the lighter fare. I picked up this book from the stand in the library because we read a book about panda last week for mountains, we will read another one next week for China, and I wanted to have something light in between. I wish we had this book for Smarty's birthday since it would fit really well with her nickname. 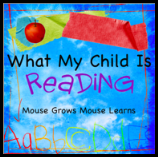 It’s a poem, and the pages are constructed in a way that the child can guess the present that each animal friend gives to Mouse based on the rhyme on the previous page. It’s very light, relatively short and beautifully illustrated – great read for adults and kids. Our geography focus at home this week was “The Children of Planet Earth”, and Smarty really enjoyed Whoever You Are by Mem Fox. I was not thrilled with illustrations – they are done in a strange style similar to old Russian religious paintings, but the story is simple and powerful at the same time. “Love is the same, pain is the same, hearts are the same, and blood is the same – all over the world”. I wish some adults that make life-and-death decisions for others took some time to read this book too. What are your children reading this week? Please link up and share. The linky is open all week. The pictures are unusual, but I think that's part of why Emma liked it. I'm glad the Leedy book worked out for you guys - it's my favorite of her books, that we've read so far. Tango makes Three sounds like a good book. I agree with you children need to learn about the diversities of families. I loved And Tango Makes Three too! (I read it for Banned Books Week, though I had heard about it before). Oh I love your list this week! We are going to have to try to find each of those! They all sound fabulous!! I really need to pick up some Leedy books! This one sounds very good. We enjoyed Whoever You Are. All of these books sound good! Mem Fox has some great books. I haven't heard of that one before, it sounds really intriguing. I have the last book but I'm going to put all the others on my wish list. They sound perfect for our unit studies!